The Manhattan-based French Heritage Society has started a restoration fund to help rebuild what was lost in the fire, which caused the roof and spire of the cathedral to collapse. New Yorkers are finding ways to help after the devastating fire that broke out at the historic Notre Dame Cathedral in Paris on Monday. The Manhattan-based French Heritage Society has started a restoration fund to help rebuild what was lost in the fire, which caused the roof and spire of the cathedral to collapse but spared much of the interior. “Protecting the architectural legacy of France is at the very heart of our mission, and we must provide whatever aid we can to this cherished monument in a time of dire need,” the nonprofit organization said in announcing the fund on its website. The society is accepting donations on its website, by mail and by phone through June 30. A spokesman for GoFundMe said over 50 fundraising campaigns had been started globally by Monday evening. The company was in the process of weeding out possibly fraudulent campaigns. "In the coming hours we'll be working with the authorities to find the best way of making sure funds get to the place where they will do the most good," GoFundMe spokesman John Coventry said. French President Emmanuel Macron said he hopes to rebuild the cathedral within five years. Macron devoted a brief prime-time televised address to the catastrophic blaze in the heart of the capital, again postponing planned remarks on his response to months of anti-government protests. The medieval cathedral, which dates to the 12th century, is one of France’s most famous tourist attractions. 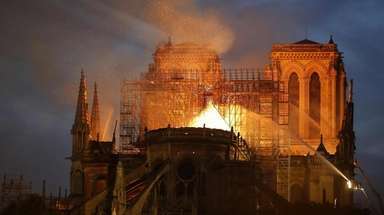 The fire swiftly ripped through the cathedral's oak roof supports, where workmen had been carrying out extensive renovations to the spire's timber-framed supports. The spire was destroyed and the roof gutted but the bell towers were still standing and many valuable art works were saved after more than 400 firemen worked to contain the blaze, finally quelling it 14 hours after it began. Paris public prosecutor Remy Heitz said there was no obvious indication the fire was arson, though investigators have begun to interview the workers involved in the renovation. Gov. Andrew Cuomo, meanwhile, had One World Trade Center's spire lit in the colors of the French flag Tuesday night in a show of support. Earlier Tuesday, St. Patrick’s Cathedral in Manhattan rang its bells to honor Notre Dame. The bells tolled at 12:50 p.m., marking the time when the fire started. Massive fire ravages Notre Dame Cathedral in ParisFrench prosecutors say the massive blaze likely was caused by accident.